Russia, Sweden, U.S. fall out of Indian fighter deal. France's Dassault Rafale and the Eurofighter Typhoon look set to be on the final shortlist for a $10 billion tender for 126 fighter aircraft for the Indian air force, after Sweden's SAAB was dropped, the Times of India said. With the Indian military due to disclose final commercial proposals from the manufacturers later today, it appears that the U.S. Lockheed Martin F-16I and Boeing Super Hornet, Sweden's SAAB Gripen and Russia's MiG-35 are also out of the running. The Indian military have only contacted the makers of the Rafale and Eurofighter for proposals according to military sources quoted in the Indian media. 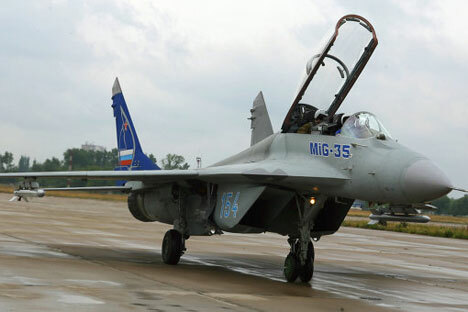 The MiG-35 did not appear in the flying display during the Aero India air show in Bangaluru in February and Indian media reports claimed it had been dropped from the list of contenders. "It is not yet official, but there could be an announcement on Thursday," an Indian defense source told the IANS news agency. The decision on the aircraft will be largely based on the results of flight trials carried out in 2010. The commercial proposals are being released today as they are only valid until the end of April and the manufacturers will not be allowed to present new ones. The Indian military want to make a selection, complete commercial negotiations and sign a contract by May 31, 2012. The contest was originally announced in 2007. The winning firm will have to invest 50% of the value of the contract in local production in India. The first 18 aircraft will be built overseas, and the rest assembled locally by Hindustan Aeronautics Ltd. (HAL).